Kim and I have visited some of Australia’s most beautiful gardens. Common to each is that extra dimension of design. A well placed pot can make an emphatic statement. 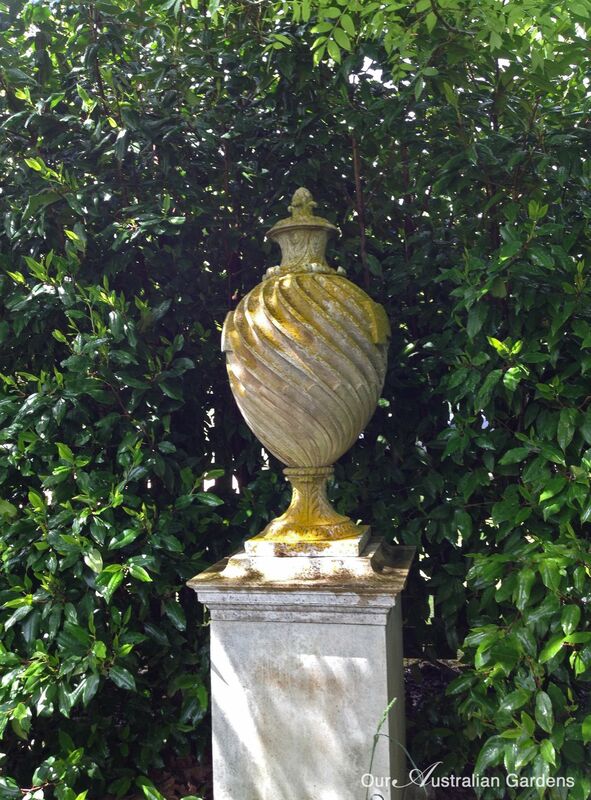 Simple yet classic: a well placed urn softened with prostrate Juniper. Visiting gardens is a joy. We take home inspiration for our own gardens – ‘I can do that too’. Sometimes we lament – ‘oh I don’t have the rainfall, I don’t have the soil…’ – that’s where pots come into their own. Both water and soil can be easily modified; and choosing a hardy plant is crucial to success. Mandevilla flowers well in confined spaces. Plenty of space for this palm. Raised pots mark the perimeter and frame the views from this expansive garden. A quirky collection of cactus and tchotchkes. An eclectic grouping of pots works if limited to confined areas. Context is also important: what works in a grand garden is not necessarily right for the simpler garden. Powerscourt garden in County WIcklow south of Dublin is 19 hectres (47 acres) of gardens complementing a grand Palladian house. Visits to grand gardens illustrate the lessons of scale and harmony. Smaller, domestic gardens cannot replicate the grandeur of the larger gardens without becoming pretentious or fussy. A single urn, placed in a green wall in a quiet area, is noticed and has an impact because of its simplicity and the lack of competing elements. This could even be a finial from a demolished building. Bonus points for recycling! This nicely restrained example of a focal point with impact is in Musk Farm, the beautiful garden of the late Stuart Rattle, near Daylesford in Victoria. Elsewhere in Stuart Rattle’s garden he employed symmetry and balance, with the view from the house centred on interesting, well chosen pots. Nests of pots (terracotta is always a good idea) hold mini kitchen gardens. Here they’re placed close to taps – and not too far away from the kitchen. We hope you enjoyed these few suggestions – there are more to come! How glorious ….. and thought -provoking. Yes maybe I can do that! Thank you Mary Jo. I don’t have pots in our garden.. they certainly do look wonderful. Love these pots – given me some ideas. Thanks! Brilliant blog! I love pots in the garden and am always looking for ideas on how and where to place to get that focal point just right. Thank you so much for your insight.